Graphic designer Carolyn Porter’s debut book Marcel’s Letters: A Font and The Search for One Man’s Fate epitomizes a “page-turner.” Her search for inspiration to design a distinctive typeface led to discovering a batch of endearing correspondence in a Minnesotan antique store. They were written by a man, Marcel Heuzé, during the Second World War. 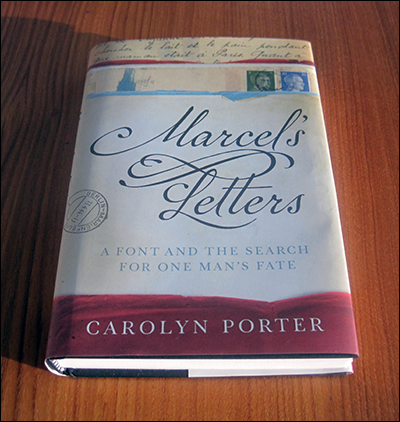 Using his lettering for inspiration, Porter’s curiosity was agitated to learn more about Marcel, his life upended by chaotic events—ultimately leading to the question incited by reading the tender letters (of which she had a portion) sent to his wife and children: Did Marcel survive to arrive home? As she scrutinized and navigated Marcel’s life, his handwritten messages to his loved ones—during the violent chaos of World War II—became a portal into another period and place. The poet William Blake gave the romantic cue to “find a world in a grain of sand.” Marcel’s letters, both their handwriting and prose—inseparable, constituted Porter’s grain of sand, steeped in human will—exacerbated by the brutality of the times. With its narrative showcasing the integral role of typography, Marcel’s Letters was published at an ideal time when typography, particularly typeface design, has more visibly joined mainstream conversation. No longer the domain of design geeks, typography is more widely viewed and discussed as a tool to help realize accessibility, branding, legibility and identity. The alignment of technology and typography also makes the book a relevant and compelling story for the modern era. Font-authoring software played a vital role in Porter’s storytelling. To borrow a typographic term, the font software is a character, whose behavior challenges not only Porter’s patience, but more aptly, her mission of piecing together the extraordinary tapestry of Marcel’s life. As a designer, I’m interested in learning how design—specifically graphic design—is a thematic and rhetorical element in Porter’s book. There’s the visible anchor of typeface design in the author’s inspiration found with Marcel’s cursive of letters, mailed to his loved ones, that segues into a wholehearted and tireless attempt to extend them into a digital font. Then there’s (and the SEGD would dig this) the role of environmental graphic design when Porter exhibited her collection of Marcel’s correspondence for friends and colleagues, especially those who contributed to the author’s research, to engage an intimate reading of them—line by line, date by date, moment to moment. Overarching is the permeation of social design, where Porter’s translation of Marcel’s letters and their use as specimens in her typeface design and production, serves to bridge the past with the present by discovering (and rediscovering) human relationships, mining Marcel’s genealogy, pushing the fact that family is really everything. Togetherness is a by-product that design helps to experience and helps endure—only time will tell. “Empathy” is declared a lot in designerly circles, especially by the Sapient/Razorfishes and IDEOs of the professional design world. Meticulous research was done by Porter, from Marcel’s circumstances at forced labor camps to martial occupation during World War II. The in-depth research led to endearing interactions (the book’s “Acknowledgments” is made more sweet by reading Porter’s story) across age, profession, media and the Atlantic. In our contemporary society, when the selfie is the relentless phenomenon, Porter’s story is a benchmark of pure unselfish empathy—achieved by a designer. Regardless of your disciplinary tribe, I recommend reading Marcel’s Letters to learn more about designer-driven empathy in action. All design educators, whatever academic department, should add this book to their reading recommendations, even make it required, to provide a well-covered insider account of design as object-making adjacent to design as giving a damn. Enthusiasts of typography and hand-lettering should read this book to further cherish the inventions of ink and paper to communicate thoughts and feelings. Everyone should read Marcel’s Letters as another timely reminder to reflect on your roots, remember them and never take for granted what stability affords, like this time-honored tradition that Marcel never gave up on reclaiming: No place like home. If you liked this lovingly-made book review, show your appreciation by supporting my labor of love—Design Feast, which proudly includes this blog. Learn how you can help.